Earlier this month our two Secretaries travelled to interview some new arrivals to the US, asking them what kind of translation help they would like. The advice these women gave them will be used to help us expand our current translator service. After completing the interview, the Secretaries dropped by DOHS headquarters to meet with the President. 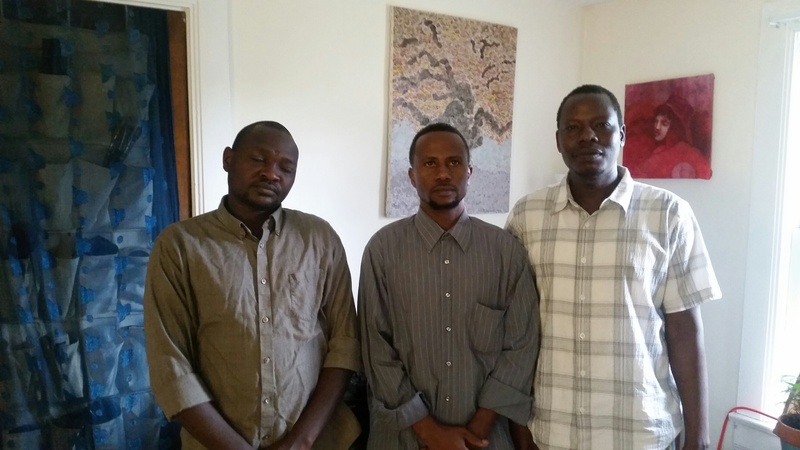 Left to right: Abdulatif Issac (Secretary), Abakar Youssif (President) and Mokhtar Abdallah (Assistant Secretary) at DOHS headquarters. DOHS has also recently acquired a Massalit language computer keyboard with which to move ahead with our literacy guidebooks, and our Facebook page hit 223 likes as of midday, August 30. And we would also like to thank all who have made cash donations over the last several weeks. Much appreciated!